Super yummy! This recipe is taken from The New Vegetarian Grill by Andrea Chesman. 1. In a small bowl, dissolve the yeast in the water and set aside until it bubbles. 2. In a food processor fitted with a steel blade, finely chop the garlic. Scrape down the sides of the bowl. Add the flour and salt and process briefly to mix. Add the yeast mixture and the yogurt and process until a soft, knead-able dough forms. Turn out onto a very lightly floured surface and knead until the dough is smooth and elastic. Place in a large, lightly oiled bowl, cover, and let rise until doubled in bulk, about an hour. 3. Prepare a medium fire in the grill. 4. Divide the dough into 8 balls. Lightly oil a work surface. Pat one of the balls into an oval. Roll out as thinly as possible. Brush both sides with olive oil. Stack on a plate as you finish rolling each ball of dough. 5. Place 2 or more flatbreads on the grill. Grill until the bottoms are browned and the tops begin to puff up, about 2 to 3 minutes. To avoid scorching, check the bottoms after 1 minute and move to a cooler spot on the grill if the breads are cooking to fast. 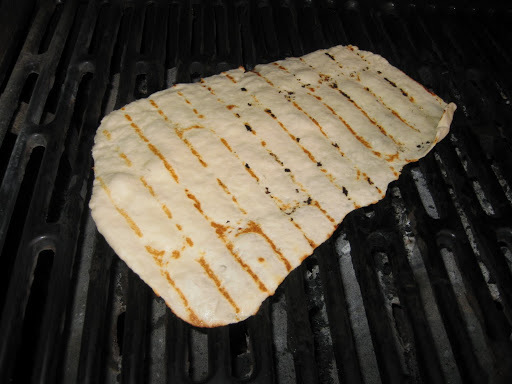 Flip the flatbreads and grill for 1 to 2 minutes more, until golden with brown spots. Remove from grill and stack in a basket to keep warm while you continue to grill the remaining flatbreads. Serve immediately. 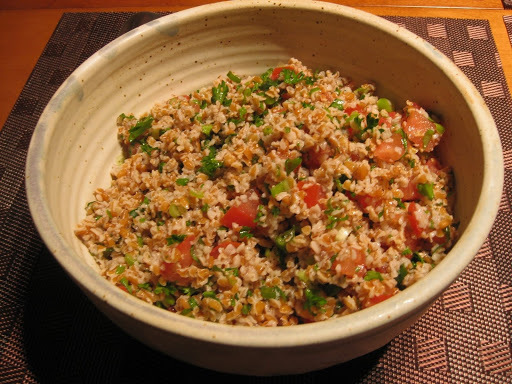 This is such a great recipe..it tastes great and it’s easy and fast to make. It is taken from The New Moosewood Cookbook by Mollie Katzen. You can prepare Steps 1 and 2 as much as a day or two day in advance. The flavors get deeper as it sits around. 2. Add salt, lemon juice, olive oil, garlic, and black pepper, and mix thoroughly. cover tightly and refrigerate until about 30 minutes before serving. 3. About 30 minutes before serving, stir in remaining ingredients and mix well. 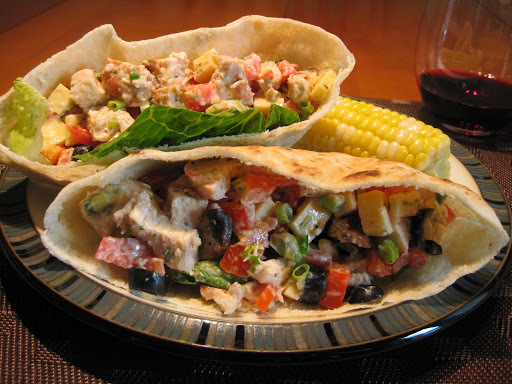 Serve cold with warm wedges of lightly toasted pita bread. This recipe calls for peanut butter chips but I prefer to use President Choice mini peanut butter melts. This recipe is from The Winnipeg Free Press Recipe Swap Favorites by Ilana Simon. Cream butter, sugar, eggs and vanilla until light and fluffy. Combine flour, cocoa, baking soda and salt; add to creamed mixture. Stir in peanut butter chips. Chill until firm enough to handle. Shape small amounts of dough into 1-inch balls. Place on ungreased baking sheet and flatten slightly with fork. Bake at 350F for 8 to 10 minutes. Cool 1 minute before removing from cookie sheet onto wire rack. Makes about 6 dozen, 2 1/2 inch cookies. All I can say is YUM!! You can prepare the salad a day in advance. Fill the pita breads just before serving. 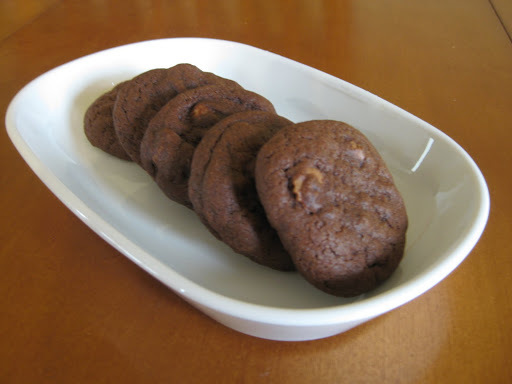 This recipe is taken from The Complete Light Kitchen by Rose Reisman. 1. Preheat grill or grill pan to medium-high and spray with cooking oil. Grill the chicken, turning once, until cooked through and no longer pink in the center, about 12 minutes. Remove from the grill, cool and dice. 2. Stir the chicken, tomatoes, green pepper, green onion, olives and feta together in a bowl. 3. Combine the sour cream, mayonnaise, lemon juice, tarragon, mustard, garlic and black pepper in another bowl, mix well. Pour the dressing over the chicken mixture and toss to coat. 4. Cut the pita breads in half and line the pockets with lettuce leaves. Divide the filling among the pitas (about 3/4 cup per half). Serve immediately. This recipe is adapted from The New Best Recipe Cookbook by Cook’s Illustrated. I use my own marinara sauce (you can find various marinara recipes on this blog) and I also melt mozzarella cheese on top. 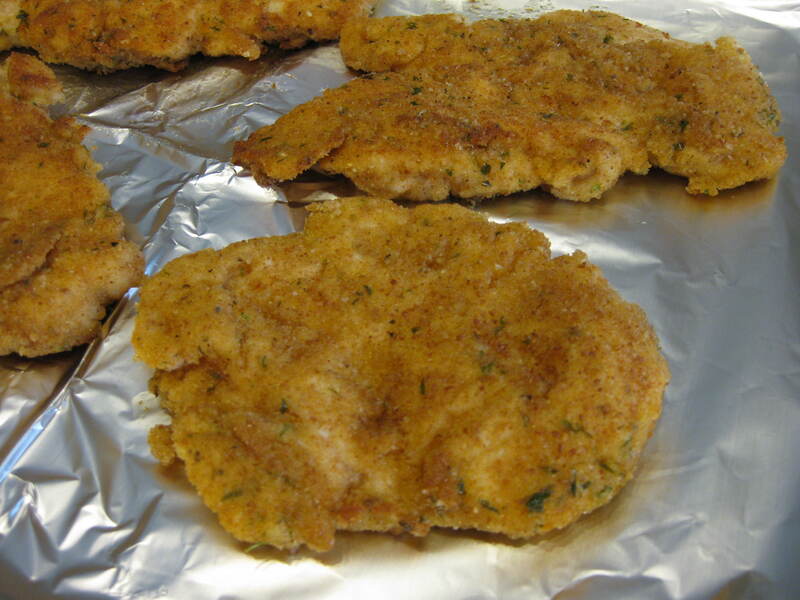 The recipe I have included is for the breaded chicken cutlets used. 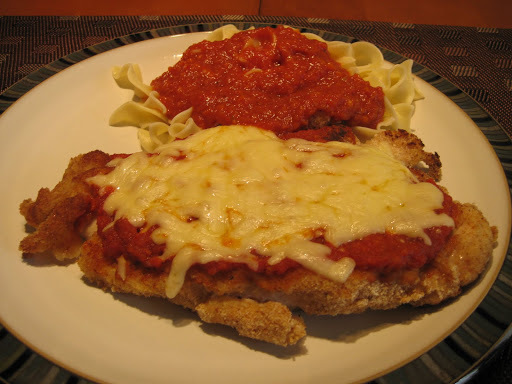 I always serve my Chicken Parmesan with egg noodles. Super easy and very filling! 1. Use a meat pounder, rubber mallet, or rolling pin to pound the chicken breasts to an even 1/2-inch thickness. 2. Sprinkle the cutlets with salt and pepper. 3. Set a large heatproof plate on the rack in the oven, and heat the oven to 200 degrees. Place the bread crumbs in a shallow dish or pis plate. Spread the flour in a second shallow dish. Beat the eggs with the 1 tablespoon olive oil in a third shallow dish. Place a wire rack over a baking sheet. 4. Working with one at a time, dredge the cutlets thoroughly in the flour, shaking off the excess. Using tongs, dip both sides of the cutlets in the egg mixture, taking care to coat them thoroughly and allowing the excess to drip back into the dish to ensure a very thin coating. Dip both sides of the cutlets in the bread crumbs, pressing the crumbs with your fingers to form an even, cohesive coat. 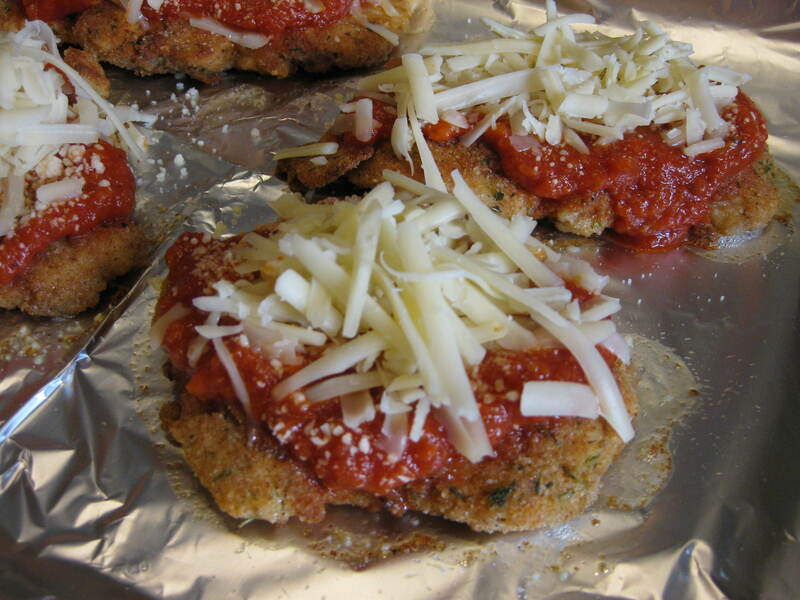 Place the breaded cutlets in a single layer on the wire rack and allow the coating to dry for about 5 minutes. 5. Meanwhile, heat 6 tablespoons of the remaining oil in a heavy-bottomed 10 inch nonstick skillet over medium-high heat until shimmering but not smoking, about 2 minutes. Lay the two cutlets gently in the skillet and cook until deep golden brown and crisp on the first side, gently pressing down on the cutlets with a wide metal spatula to help ensure even browning, about 2 1/2 minutes. Using tongs, turn the cutlets, reduce the heat to medium, and continue to cook until the meat feels firm when pressed gently and the second side is a deep golden brown and crisp, 2 1/2 to 3 minutes. Line the warmed plate with a double layer of paper towels and set the cutlets on top; return the plate to the oven. 6. Discard the oil in the skillet and wipe the skillet clean using tongs and a large wad of paper towels. Repeat Step 5, using the remaining 6 tablespoons oil and the now-clean skillet to cook the remaining cutlets.